Macau or as the Chinese spell it, Macao, is the gaming capital of the world. Its annual gaming revenue stream is set to be five times that of Las Vegas by the end of this year and it's expected to continue to grow. However while Macau is the gaming capital or Asia, all it really has to offer in terms of gaming is gambling. Originally a Portugese colony until 1999, Macau is part of China. While Macau is part of China it also isn't; like Hong Kong, it falls under the "one country two party system" which makes Macau a "special administrative region" or SAR. This SAR status allows Macau pretty much freedom to do and govern however the people see fit, so long as they don't secede from China proper. What it means to gamers and the like is that Macau doesn't have a silly Great Firewall which blocks websites deemed inappropriate to China, and that Macau doesn't have a ban on video game consoles. Not being a gamblermyself, there was little for me to do in Macau except for eating and soaking in a pool of my and other people's filth at the hotel. Of course since Kotaku is a gaming a site, I figured I'd go out about Macau to find out where locals go to play games. Macau is made up of about two islands and a peninsula, Macau peninsula, Taipa and Coloane, all connected by a strip similar to the Vegas strip called the Cotai strip. Along this Cotai strip are casinos and resorts which rival those in Vegas; they even have a Venetian resort that is pretty much a straight copy of the one from Vegas (owned by the same people who built it in Nevada). 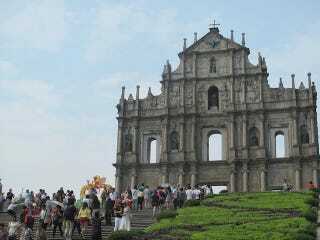 The Taipa and Coloane islands are pretty much resort islands and the gist of Macau's business is done on Macau island. Unlike many major Asian cities, Macau doesn't exactly have a central "tech/gaming" market. It also doesn't have a giant physical gray market. Due to the size of Macau and the lack of non gambling international attention it receives, it doesn't get many direct game releases, often times piggy backing onto Hong Kong releases. Video games in Macau are sold in either mom and pop shops, small chain stores, or Toys R' Us. Toys R' Us is the single largest video games retailer in Macau. Video game stores, even those found in shopping centers (all except Toys R' Us) operate in a fashion similar to a gray market store. Games are sold either in their Japanese version, US/European version or the pan Asian HK version. It's easy to walk into a video game shop in Macau and see the ESRB rating right next to a CERO rating. I talked to a few game shop owners during my "journey" across the city looking for video game shops, and most openly say that they get their games through the "wet market" which is another term for saying imports. When asked where the imports came from, they said Hong Kong. Perhaps its because that it's such a small island that Macau doesn't have a centralized "tech/gaming" center, Macau isn't a place that lacks video games. Peppered around the island are lots of shops that can cater to any gamer's wants and whims, something that is difficult to find in China.